My father spent much of his life traveling. On his first solo trip in the 60s, he found himself in a youth hostel, in Lausanne, Switzerland. On the dirty floor, near his cot he spotted a small plastic figurine. It was Saint Nicholas, the patron saint of travellers (probably the gift of an overprotective mother, meant to guard her wandering child, but already lost). He picked it up and carried it with him, not for protection, but as the start of a collection. 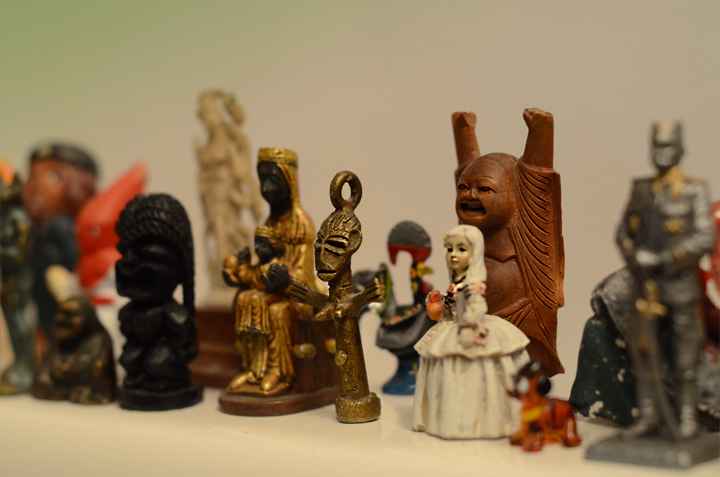 From then on, he bought or found small figurines on most of his trips, building a collection of tiny goddesses and buddhas, animals, cultural leaders and mythical creatures. We called them ’little gods’ (or in Serbian ‘bogici’). And so the collection grew, and recently (after some convincing) it came into my possession. The requirement of each object is that it must be small and somehow culturally significant. It could be a deity, a political figure, a kitschy stereotype, a national animal... Each one certainly reminds us of the place we visited, but when they are at home, sitting on the shelf together, they take on a new life. A rag-tag gang of worldly creatures that relate and react to one another by mere proximity, contrasting shapes and experiences. Generals casting disdainful looks, madonnas pious and still, buddhas grinning.